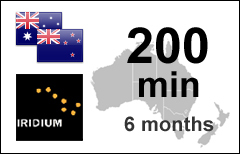 The Southern Cross 200-min voucher refills your existing Iridium Southern Cross account with Sattrans. IMPORTANT! The Southern Cross plan has been discontinued. No voucher reloads are possible any longer. Any vouchers reloaded before Feb 15, 2017 will be valid for 6 months from the reload date. Maximum Account Validity. The maximum validity of a Southern Cross account cannot exceed 6 months from the date of the most recent voucher reload. Maximum Age Limit. The Maximum Age Limit of the minutes in a SC-200 voucher is 3 years.